The hip articulation is true diarthroidal ball and-socket style joint, formed from the head of the femur as it articulates with the acetabulum of the pelvis. This joint serves as the main connection between the lower extremity and the trunk, and typically works in a closed kinematic chain. Flexion: forward and upward movement of the femur at the hip occurs in the sagittal plane about an medial-lateral axis. Extension: upward movement toward the rear of the body of the femur at the hip occuring in the sagittal plane. Abduction: movement of the femur on the hip in a direction away from the midline of the body in the frontal plane. Adduction: movement of the femur on the hip in a direction toward the midline of the body in the frontal plane. Internal Rotation: rotation of the femur toward the midline of the body in the transverse plane. External Rotation: rotation of the femur away from the midline of the body in the transverse plane. Ligamentum Teres: This ligament is located entirely within the hip joint. It spans the hip running from the acetabular notch to the fovis capitis of the femur, attaching the femoral head to the inferior acetabular rim. This ligament is joined with nerves and vessels that pass to the femoral head. The vascular component of this structure is important during development, but is less significant in children. This ligament becomes taut during adduction, flexion, and external rotation, but only minimally contributes to joint stability. Ischiofemoral Ligament: Is the only ligament located on the posterior aspect of the hip. It attaches to the posterior surface of the acetabular rim and labrum. This ligament is said to "wind" around the joint and insert on the anterior aspect of the femur. The location and orientation of this ligament reinforces the joint capsule posteriorly and checks against excessive extension and internal rotation of the hip joint. Iliofemoral Ligament (Y Ligament of Bigelow): Attaches to the AIIS and then fans out to attach along the intertrochanteric line of the femur. The iliofemoral ligament is the strongest ligament in the body, and checks extension, adduction (superior fibers), and abduction (inferior fibers). In addition, because this ligament limits hip extension, it allows maintenance of the upright posture by reducing the need for muscle contractions. Pubofemoral Ligament: Is located on the anterior portion of the joint, arising from the anterior aspect of the pubic ramus and passing to the anterior surface of the intertrochanteric fossa. This ligament's main purpose is to check hip abduction and extension. This ligament may blend with the inferior fibers of the iliofemoral ligament. The hip joint is extremely strong, due to its reinforcement by strong ligaments and musculature, providing a relatively stable joint. Unlike the weak articular capsule of the shoulder, the hip joint capsule is a substantial contributor to joint stability. The capsule is thicker anterosuperiorly where the predominant stresses of weight bearing occur, and is thinner posteroinferiorly. The labrum forms a fibrocartilagenous extension of the bony acetabulum, mostly composed of type 1 collagen that is typically between 2-3mm thick. It lines the acetabular socket and attaches to the bony rim of the acetabulum. It has an irregular shape, being wider and thinner anteriorly and thicker posteriorly. On the anterior aspect, the labrum is triangular in the radial section. On the posterior aspect, the labrum is dimensionally square but with a rounded distal surface. The transverse ligaments surround the hip and help hold it in place while moving. It is thought that the majority of the labrum is avascular with only the outer third being supplied by the obturator, superior gluteal and inferior gluteal arteries. There is controversy as to whether there is a potential for healing with the limited blood supply and this is an important clinical consideration. The superior and inferior portions are believed to be innervated, containing both free nerve endings and nerve sensory end organs (giving the senses of pain, pressure and deep sensation). Pressure distributor - obstructs fluid flow in and out of the joint through a sealing action which is often referred to as a “suction effect” in view of the resistance generated to distraction of the head from the acetabular socket. This sealing function not only enhances joint stability, but is thought to more uniformly distribute compressive loads applied to the articular surfaces, thereby reducing peak cartilage stresses during weight-bearing. Full extension of the hip joint is the closed packed postion because this position draws the strong ligaments of the joint tight, resulting in stability. The hip joint is one of the only joints where the position of optimal articular contact (combined flexion, abduction, and external rotation) is the open-packed, rather than closed packed position, since flexion and external rotation tend to uncoil the ligaments and make them slack. Femoral Triangle: The femoral triangle is the region defined by the inguinal ligament superiorly, the adductor longus medially, and the sartorius laterally. This region is important because it contains numerous vascular and neural structures, including the femoral vein, artery, and nerve. Femoral Angle of Inclination: The angle of inclination is formed from the angle resulting from the intersection of a line down the long shaft of the femur and a line drawn threough the neck of the femur. Typically, the normal adult has an angle of inclination between 120 and 125 degrees, it usually is closer to 125 in the elderly. An increase in this angle, greater than 125 degrees, results in coxa valga, and a decrease is called coxa vara*. Femoral Angle of Torsion: The angle of torsion is formed by looking at the relationship between the axis of the femoral head and neck and the femoral condyles. The normal femur has an angle of torsion between 12 and 15 degrees. An increase in this angle is termed anteversion, while a decrease in this angle is termed retroversion*. It is important to note that both normal and abnormal angles of inclination and torsion are properties of the femur, and exist independently of the hip joint, however, abnormalities typically alter joint stability. When any of the features of lateral balance control fails, the supporting is upset. The pelvis tends to fall on the unsupported side when the individual stands on the affected limb. This is called Trendelenberg sign. The person walks with a characteristic lurching or waddling gait. In A: Negative trendlenberg's test. The hip abductors are acting normally tilting the pelvis upwards when the opposite leg is raised from the ground. Can be compressed at lower border of gluteus maximus by sitting on a bench with a sharp edge. May be injured by misplaced deep intravascular injections. To prevent this, the injection is usually given in the superolateral quadrant. May be injured in posterior dislocation of the hip joint. Pelvic structures may protrude through the greater sciatic foramen. This is called sciatic hernia. It compresses the contents of the foramina and may present with pain, numbness and weakness in the lower limb if sciatic nerve is compressed. The extensive bursa between the great trochanter and the gluteal aponeurosis may be a site of infection. Patient complains of pain and swelling in the trachanteric region. Sometimes there may be a pus discharge. In this condition, a snap is heard and felt on certain hip movements. The snap is attributed to slipping of a tendinous aponeurosis- probably that of the gluteus maximus – over the greater trochanter. It is harmless and treatment is not required. Pain of a prolapsed or strained lumbar intervertebral disc if often referred to the gluteal region or lateral aspect of the thigh. Inflammation of the bursa over the ischial tuberosity. When it pierces piriformis, it may be compressed by contractions of this muscle. This causes piriformis syndrome. ↑ 2.0 2.1 2.2 2.3 Levangie P, Norkin C. Joint structure and function: A comprehensive analysis. 4th ed. Philadelphia: The F.A. Davis Company; 2005. ↑ Anerson L. The anatomy and biomechanics of the hip joint. J Back Musculoskeletal Rehabil. 1994;4(15):145-153. ↑ 4.0 4.1 4.2 Groh MM, Herrera J. 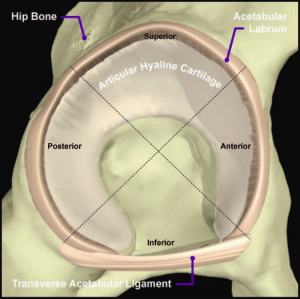 A comprehensive review of hip labral tears. Curr Rev Musculoskeletal Med. 2009; 2:105 - 117. ↑ 5.0 5.1 Lewis C, Sahrmann S. Acetabular labral tears. Physical Therapy. 2006;86(1):110-121. ↑ Crawford M, Dy C, Alexander J, et al. The 2007 Frank Stinchfield Award. The Biomechanics of the hip labrum and the stability of the hip. Clinical Orthopaedics and Related Research. 2007;465:16-22. ↑ Byrd JW. Labral lesions: an elusive source of hip pain case reports and literature review. Arthroscopy 1996;12:603–612. ↑ Martin RL, Enseki KR, Draovitch P, et al. Acetabular labral tears of the hip: examination and diagnostic challenges. J Orthop Sports Phys Ther 2006;36:503-15.